What is the ultimate goal of Category Management? 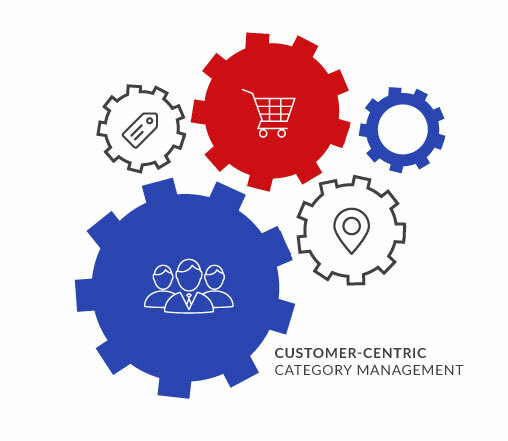 Category Management is the collaborative process of organising categories as independent business units, aimed at producing business results by focusing on delivering value to a customer. Category Management also aims to provide customers with what they want, where they want it, and when they want it. To do so, products are grouped into categories according to how they are used, consumed or purchased. The goal of Category Management is to obtain long-term improvements in the efficiencies of the retailer, which leads to increased sales, an improved shopping environment, and customer loyalty. 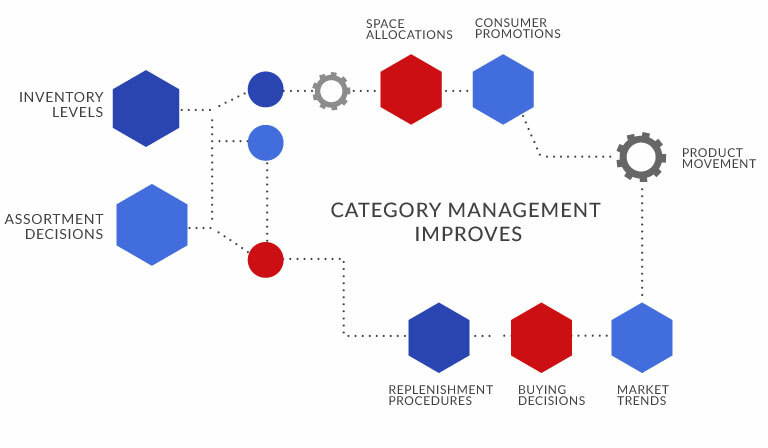 The idea behind Category Management is also pretty straightforward: to manage each product category in a way that enables maximum consumer appeal while maximising profits. As a Category Manager, you learn how to develop the best possible customer proposition by implementing data-driven assortment planning, having prices that are competitive, promotions that are attractive, and visually appealing planograms. Where do you come in with category management? 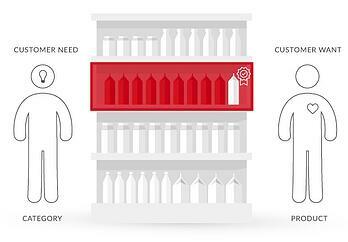 As a shelf planner, you need to continually strive to understand the customer when making decisions regarding a shelf. That's because each aspect has an impact on the other. For example, the size of your product will impact where you place the product. The marketing message may have an impact on the price. However, the consumer decision making process is at the centre, so the spending power of your customer will impact which products you keep in store, and where you keep these products. While there is debate over the number of steps that are involved - some say as many as eight while others peg it at five, at DotActiv, we follow a six-step process. The purpose of the category definition step is to determine the specific SKUs (Stock Keeping Units) that make up your category. The appropriate starting point here would be to put yourself in the shoes of your customers and ask how they would define the category. The category definition generally asks what “consumer need” must you satisfy? The category fulfils the need and the specific product fulfils the consumer want. There are various factors that should be taken into consideration before creating the category hierarchy and consumer decision tree. Below is an example of what your consumer would usually consider when purchasing a cold beverage. That said, it is highly unlikely that there is only one consumer decision tree per category. That's because there are different consumer behaviours based on cultural, personal, physiological and social factors that exist within a consumer base, and for each of these segments there is a different focus or priority. For example, your shoppers may be price sensitive, which means price will feature higher on their consumer decision tree. On the other hand, they may be highly visual, which means packaging and brand becomes key in their decision-making. Meanwhile, others could be looking for functionality and convenience. Thus packaging functionality, such as individually wrapped products or the ability to reseal an opened product may influence their decision. Also, the segments that exist are likely to vary by category so it's key to understand your consumer and what's important to them. A major component in the category definition phase is developing a consumer decision tree. A consumer decision tree (CDT) is a graphical record that assists retailers to better understand consumer buying habits and the decision making processes followed by individuals while shopping a Category. For example, the consumer walks into a store, what happens next? Where do they go? What do they see? What do they buy? Why use a consumer decision tree? Consumers are the people who are making the decision at the point of purchase. They make the ultimate decision as to what goes into the trolley or basket. They are the ones navigating the shelf and selecting from the range presented. Therefore, it makes more sense, from a shelf planner point of view to consider a consumer decision tree when deciding on a shelf-layout. 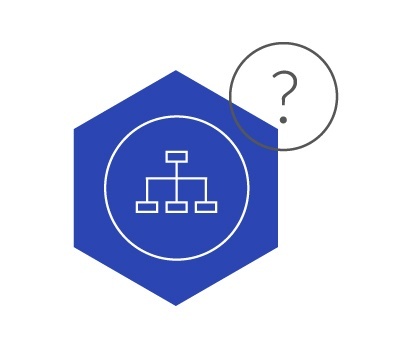 What is a category hierarchy? A category hierarchy is the grouping of categories and subcategories into super groups. 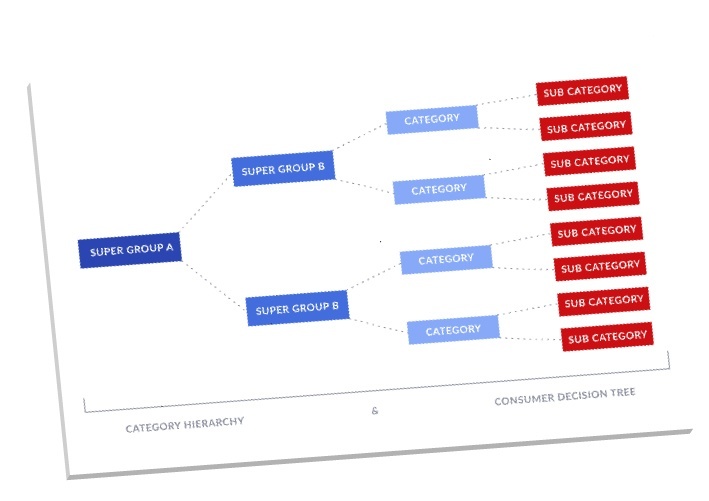 Assigning a product to a Sub-Category, Category, Super Group B and finally a Super Group A helps you to better analyse the performance of a product within category and super group. This leads to better placement and better consumer understanding from a retailer and supplier level. Your hierarchy is informed by the consumer decision tree. It helps drive tactical decisions on price, promotion, product assortment and store location. There are four main consumer-based category roles that you should know. This is a category with which the retailer wants to profile himself towards his target consumers and differentiate himself from competition. It aims to offer superior value to consumers and define the retailer as store of choice. This category that aims to provide consistent and competitive value for the consumer’s everyday needs. This category assists to develop the target consumer’s image of the retailer. This category refers to products which are not purchased on a regular basis but occasionally. Seasonal categories play a secondary role in delivering profit but can be used by a retailer to differentiate himself from competition during a certain period of the year. A convenience category completes the retailer's assortment with products that are not usually found on a routine shopping list. This category aims to guarantee a one-stop-shopping and plays an important role in margin enhancement. 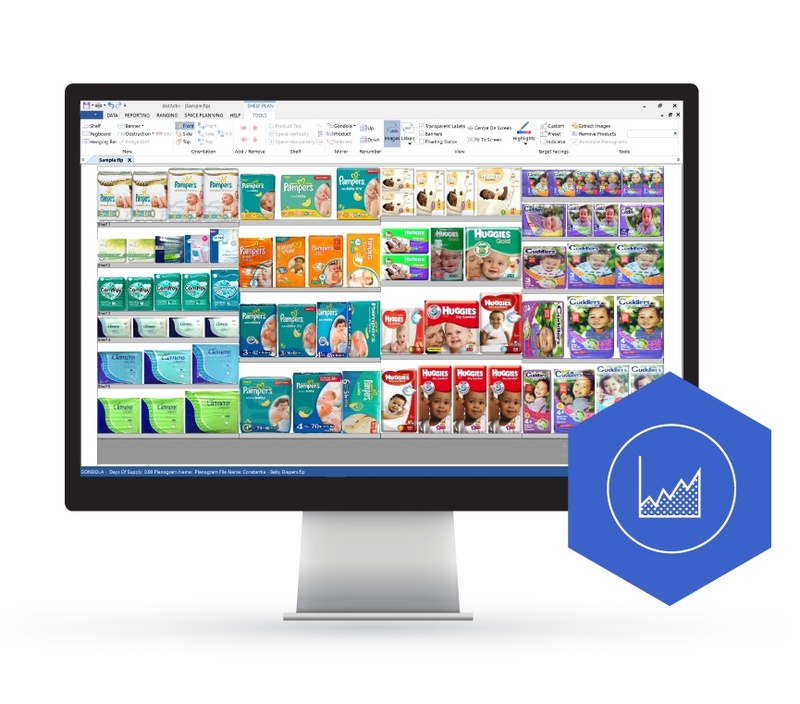 Insight generation primarily involves competitor research, sales data, and in-depth analyses so that you can make better decisions regarding the layout of a shelf. 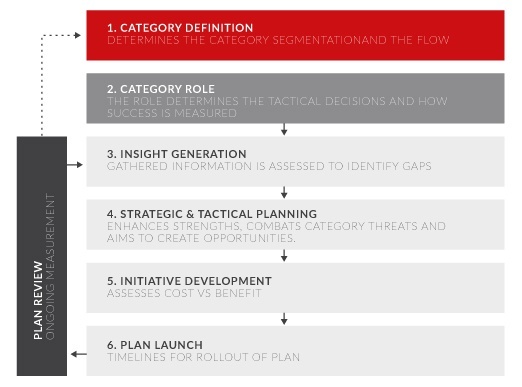 Category strategy: This looks at the category definition, category role and the tactical planning tactics that will be implemented in order to improve the overall category performance. The use of this data and advanced analytics will benefit retailers in almost all areas of the business. It will help to identify gaps between the current and desired state of the category and drive the strategic and tactical planning decisions. For instance, loyalty analysis, which measures purchase frequency or penetration among high-priority consumer segments, allows you to understand product categories from a consumer perspective. By measuring consumer “switching” behaviour, you can also identify which SKUs play a unique role and which are redundant. Meanwhile, in using market basket analysis, you can identify key value items by consumer segment. You can thus set prices based on consumer demand and competitor moves. You can also tailor offers and promotions to consumers based on their past behaviours, thereby increasing total basket profitability and loyalty. This is the step where strategies are developed to deliver on the category role. Category role determines the depth of an assortment; whereas strategies determine the assortments focus. Strategies enhance the strengths of the category, focus on combating category threats, and create opportunities for the segments. 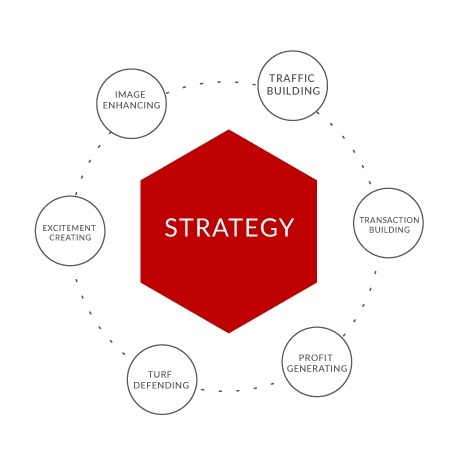 Traffic Building; Transaction Building; Profit Generating; Turf Defending; Excitement Creating; and Image Enhancing. The goal of category tactics is to choose the best action to achieve a specific strategy based on the role the category plays. In determining the appropriate tactic, you must review the four basic category roles (Destination, Routine, Seasonal, and Convenience). These roles determine how the retailer makes decisions about the implementation of each tactic. 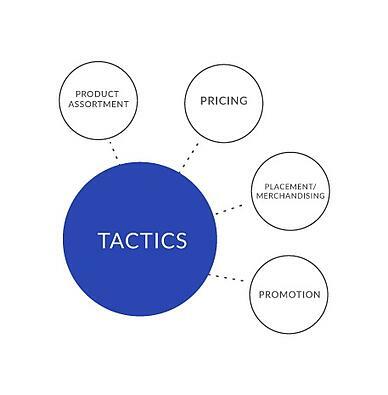 The tactics used are the 4 Ps : Product Assortment, Pricing, Promotion and Merchandising Placement. During initiative development, you need to assess the cost versus the benefit of the plan before prioritising the next steps for implementation. This step is used to implement the category business plan through a systematic schedule and list of responsibilities. Implementing category plan as per the objectives laid down is the path to the success of a merchandising strategy. A typical category plan under implementation stage includes: what specific tasks need to be done; when to do; where to do, and who will do it. It is vital that you secure commitment to resources for implementation otherwise all the hard work put into the first few steps will be wasted without the right actions in place. The plan launch requires you to create a timeline for rolling out the Category Management plan you've created. A Category Review is not necessarily listed as a step within the Category Management process as it needs to be completed on an ongoing basis. This step is rather an ongoing measurement of the progress of the category plan and is a key indicator of the category's success which allows you to determine whether or not changes should be made to the category plan. 1. Monitor 2. Measure 3. Make changes 4. Maintain 5. Move forward. Having a strong assortment planning strategy is a big part of Category Management and is focussed on making the right products available in the right stores and at the right time. Opposite is an example of some of the metrics (taken from DotActiv Lite) that retail professionals use to create attractive assortments. 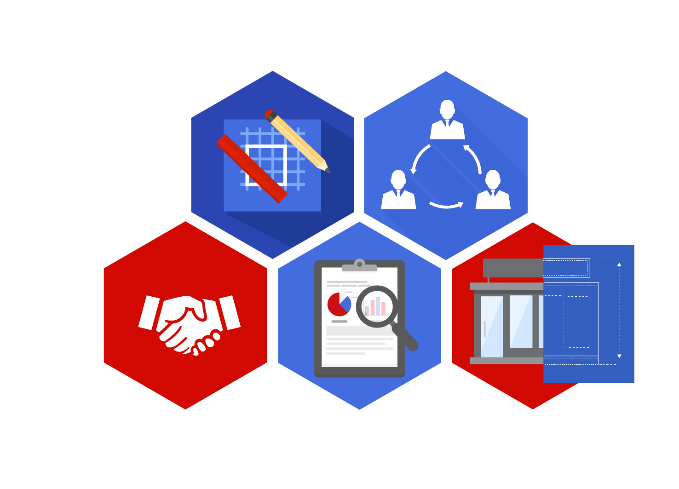 For the selection process, assortment planning software will use a set of rules to apply. Rules may include : Sales of a Product, Units Sold, Time on Shelf, External Sales Rank, House Brand, Top Brands, Colour or Flavour, and Profitability. This selection process will help you select those products which are performing well internally and externally, and develop Category Management strategies that will better reach the target market/shoppers. A floor plan consists of a collection of planograms set out in a logical order, for a store or various stores so as to maximise the utility of the available floor space. 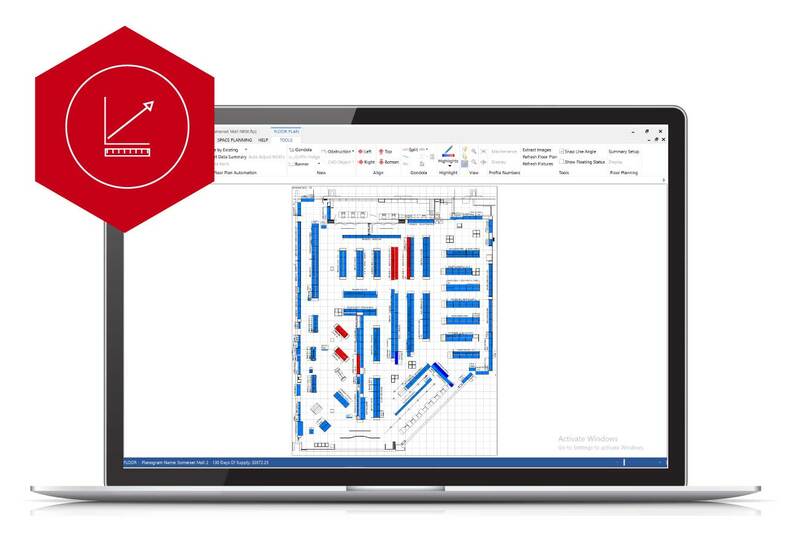 Floor planners use specialised floor planning software to create heat-mapped floor plans. This helps you to optimise shopper traffic and to reduce congestion during peak hours. Having products displayed in the same locations in all chains creates brand consistency; which is beneficial to you if you have more than one store in a region. Customers are more likely to return to a store when they know where to find the product that they are looking for regardless of which store they are visiting. By taking into account the number of days it takes for a particular product to sell out, you can balance the space on the shelf to the sales of each product. This will help you to maximise your sales per square metre. If the product takes longer to run out, give it less space and allocate that space to a product that sells out faster. In this way you can increase your sales and profits. A planogram is a diagram, drawing or visual representation that indicates how and where products should be placed on shelves. Generating planograms that display products on shelf in a visually appealing, logical and convenient way will help to attract and retain more shoppers. Space planners use planograms to create logical product flows so that shoppers can easily navigate around the store and find what they need. 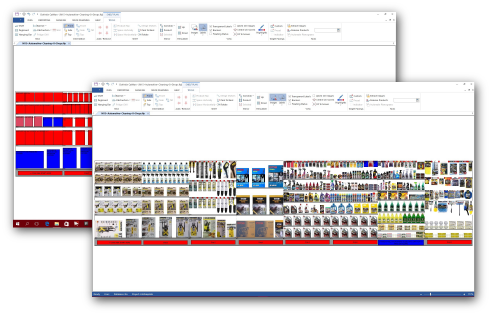 Planograms also make shelf replenishment easier for store personnel who can at any time refer to the planogram which will indicate to them how products should be merchandised. Planograms are a valuable tool for retail executives who have more control over their merchandising strategy and how shelves in their stores are being packed. 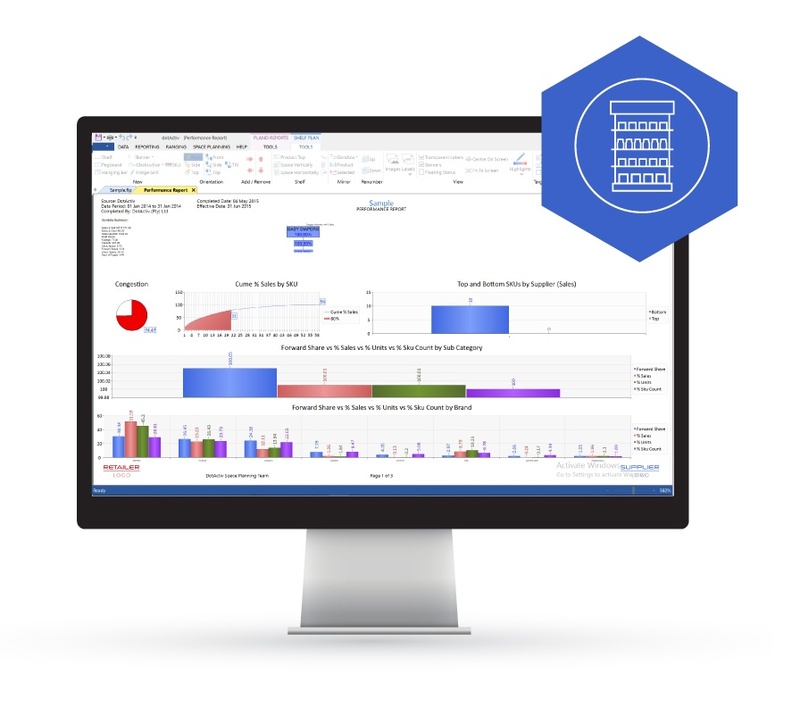 With the use of effective Category Management business intelligence tools, you are able to decide on the best possible pricing. By analysing data to calculate things like price elasticity, you can price your products to optimise for customer satisfaction and profit. Planograms are used to determine space allocation and measure how fast a product moves on a shelf. 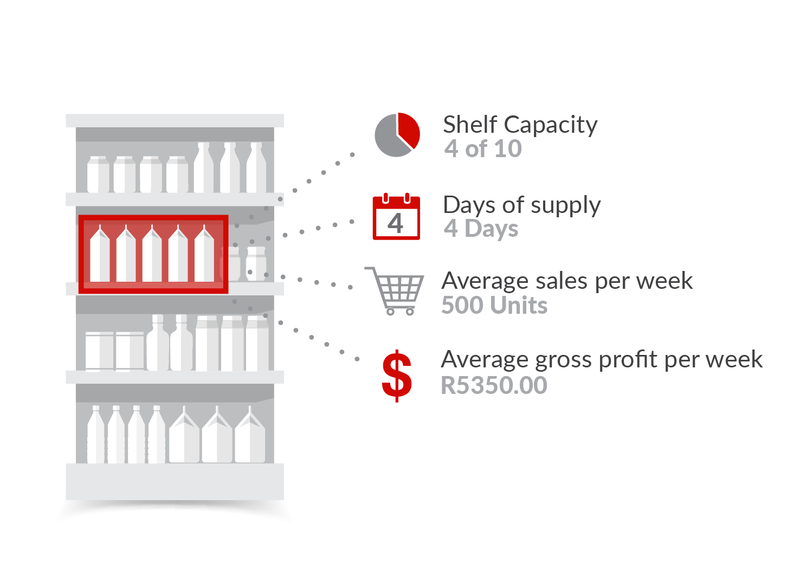 This will help determine the amount of SKUs you must order to ensure consistency of the days of supply for the products on a shelf. 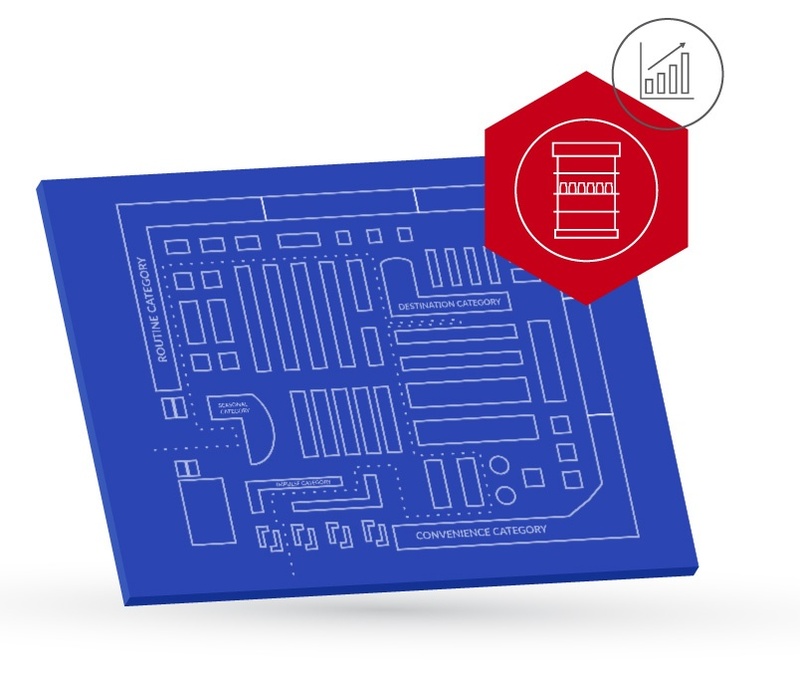 An effective planogram will make the shelf replenishment cycle much easier, resulting in decreased stock holding, reduced out of stocks, optimised stock rotation and increased inventory control. For example, by using a product minimum display quantity, you can control running out of stock and the timing to place new orders. Promotions are a good way to offer new and known products at discounted prices. Shoppers see these promotions on gondola ends, shelf hotspots and other convenient areas.